That Sprint's first Android phone's going to be the HTC Hero is about as unsurprising as news gets, but you know what is surprising? They've given it some invasive plastic surgery, and priced it squarely below their own Palm Pre. Sprint's Hero is a bit blobbier than HTC's original, but it also looks less chinny—an HTC design quirk that's starting to get on some people's nerves—and at any rate, there isn't a whole lot of the Hero that isn't the screen, so aside from the shuffled hard buttons, this redesign shouldn't change too much in terms of usability. Wisely, Sprint left the Hero's guts—hardware and software—intact. That's the same 3.2-inch multitouch capacitive screen, the same 5-megapixel camera, the same microSD slot (Sprint throws in a 2GB card for free), the same 3.5mm headphone jack, the same multitouch browser (no mention of Flash support though) and the same Sense UI, which converts Android into something unexpectedly beautiful, but tragically sluggish. And since this thing obviously supports EV-DO, we'll finally get to play with it on proper 3G. Whether or not they'll be able to load HTC's latest Sense update—the one that fixes basically every complaint we had with the original Hero, including slowdown—before the handsets ship is still up in the air, but in any case, it's coming eventually. The $180 price assumes a 2-year agreement at a minimum of $70 a month, and that you've got the initiative to mail in a rebate form, though just like with the Pre, there's a good chance retailers like Best Buy'll just take care of this for you. Like the Pre, the Hero is eligible for the $100 Everything plan, which is just about the best deal going for obnoxiously talky/texty types. So, uh, Sprint's kind of killing it these days, no? They've got their iron grip on the only two smartphone underdogs anyone really cares about: the first of which made all the other carriers' Palm phones look pathetically lame; and the second of which looks like it'll sucker-punch a complacent T-Mobile right off its Android throne—especially considering the fact that Sprint's priced this thing a few bucks below T-Mo's categorically less good MyTouch 3G. It may have taken a year, but this whole Android thing is finally getting interesting. OVERLAND PARK, Kan., and BELLEVUE, Wash. – Sept. 3, 2009 – Sprint (NYSE: S) and HTC Corporation today announced the upcoming arrival of the first wireless device offering the combination of the open and innovative Android platform with the high-speed connectivity of America's most dependable 3G network1 (EVDO Rev. A), HTC Hero™ with Google™. Offering a rich mobile Internet experience, the much-anticipated HTC Hero offers synchronization for built-in Google mobile services, including Google Search™, Google Maps™, Gmail™, and YouTube™ as well as access to thousands of applications built on the Android platform. As a charter member of the Open Handset Alliance™, Sprint is actively engaged with the Android community. Through Android Market™, HTC Hero users have access to more than 8,000 useful applications, widgets and fun games to download and install on their phone, with many more to come. Thousands of developers are working to introduce new Android applications every day. HTC Hero is the first U.S. device to feature HTC Sense, an intuitive experience that was built with a guiding philosophy to put people at the center and allows the device to be completely customized to the wants and needs of the user. The device's seven-panel wide home screen can be populated with customizable widgets that bring information to the surface. HTC Hero users can easily create and switch between Scenes to reflect different moments or roles in their lives, such as work, social, travel and play. For example, a work Scene can be easily set up to include stock updates, work email and calendar, a play Scene could have music, weather, and a Twitter feed or a travel Scene could offer instant access to the local time, weather and maps. 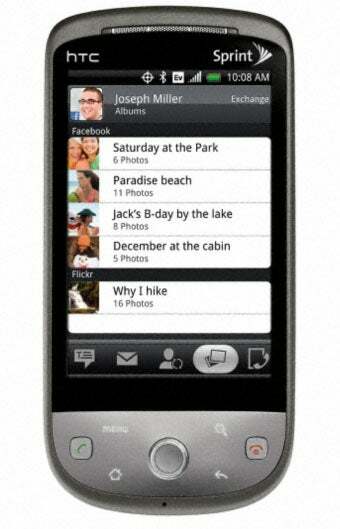 HTC Hero features an integrated 5.0 MP camera and camcorder. It also offers easy access to personal and business e-mail, instant messaging and text messaging through POP, IMAP, and Exchange Active Sync accounts.